Bryson James Aldrich DeChambeau professionally known as Bryson DeChambeau is an American professional golf player. He stands at number 12 in world ranking. He is often described as golf's mad scientist for his self developed unique swing techniques. DeChambeau plays PGA Tour. Dechambeau became the fifth player in the history to win both the NCAA Division I championship and the U.S. Amateur in the same year 2015. He also became fourth player to win the NCCA Championship, the US Amateur title and three PGA Tour events before their 25th birthday. Last week, Dechambeau has just won the The Northern Trust for his first playoff victory on August 26, 2018 at Ridgewood Country Club. Becoming 5th player in history to win both NCAA Division I Championship and the U.S. Amateur in the same year. Bryson DeChambeau was born on September 16, 1993 to father John Howard Aldrich Dechambeau and a mother Janet Louise Druffel in Modesto, California, United States. At the age of seven, Dechambeau moved to Clovis, east of Fresno. He completed his schooling from Clovis East High School and studied graduation in Southern Methodist University in Dallas, Texas majoring in Physics in scholarship. In 2010, Dechambeau already won the California State Junior Championship at the age of 15. In June 2015, Dechambeau became the first SMU Mustang to win the NCAA individual championship by one stroke with a record score of 280(-8). In August same year, he defeated Derek Bard 7 & 6 in the 36-hole final and won the U.S. Amateur title. And he joined the list of players in history to win both the NCAA and U.S. Amateur titles in the same year. He became 5th player to do so along with Jack Nicklaus in 1961, Phil Mickelson in 1990, Tiger Woods in 1996 and Ryan Moore in 2004. Dechambeau debuted in PGA Tour as an amateur in June 2015 at the FedEx St. Jude Classic near Memphis, Tennessee. Dechambeau finished 45th place in the tournament. He also played U.S. Open at Chambers Bay as his first major championship tournament. He missed the cut by four strokes in the tournament. DeChambeau finished runner-up with John Senden and Andrew Evans at the 2015 Australian Masters in November. He was just two shots behind the title winner Peter Senior. He was the low amateur at the 2016 Masters and tied for 21st place in the end. After playing the Masters in mid-April 2016, Dechambeau turned into a professional golf player. He signed a long-term agreement with Cobra-Puma Golf. Few days later, he made his debut as a professional golfer at the RBC Heritage in South Carolina. Dechambeau finished fourth in the tournament and successfully earned $259,000 from the tournament. Initially, DeChambeau did not earned enough to qualify for a PGA Tour card. But he made it to the Web.com Tour Finals. DeChambeau earned PGA Tour Card for the 2017 PGA Tour by winning DAP Championship as his first professional win. DeChambeau won his first PGA Tour victory on July 16, 2017 by winning the John Deere Classic by a single stroke. He defeated Patrick Rodgers in the tournament and gained a place in the 2017 Open Championship. DeChambeau won the Memorial Tournament in Dublin, Ohio on June 3, 2018. He won the tournament in sudden-death playoff against Kyle Stanley and An Byeong-hun. Recently, Dechambeau won the The Northern Trust for his first playoff victory on August 26, 2018 at Ridgewood Country Club. Dechambeau also established a new record for the tournament with a score of 266, besting the old Ridgewood record of 270. The previous record was set by Hunter Mahan in 2014. All of the irons and wedges of DeChambeau are cut to exactly the same length of 37.5 inches i.e 0.953m. Their lie and bounce angle are also the same. Only the lofts are different. Dehcambeau keeps his club on the same place throughout his swing and doesnot turn his wrists during his swings. His instructor Mike Schy suggested JumboMax Grips in 2011. Its the largest grips commercially available which allows DeChambeau to hold the grips in his palms and not his fingers. Until today, how much does Dechambeau earns has not been officially revealed to any sources. No doubt, he earns handsome amount of money every year. As a result, net worth of DeChambeau is also still unknown. Bryson is well focused on his career rather than being involved in love affairs. He is young, talented and attractive, but there is no any solid proof that Dechambeau is in relationship with anyone. Being a celebrity, whether he is single or comitted will always be a matter of concern to the public or his fans. Rumour says DeChambeau was in relationship with a gril named Brunette back in high school. 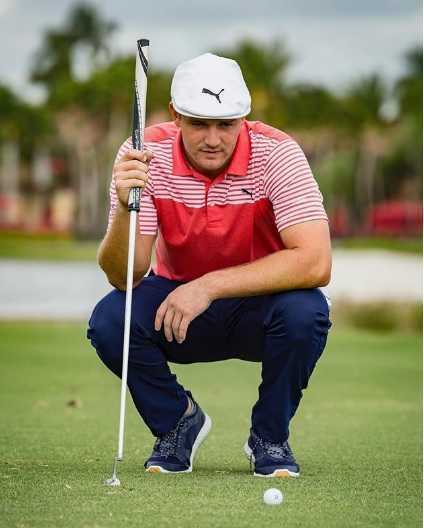 DeChambeau recently won Northen Trust on August 26, 2018 and made a new record score of 266 beating record score of 270 set by Hunter Mahan in 2014. DeChambeau became 5th player in history to with both NCAA Division I championships and the U.S. Amateur in a single year after Jack Nicklaus in 1961, Phil Mickelson in 1990, Tiger Woods in 1996 and Ryan Moore in 2004. DeChambeau already won the California State Junior Championship at the age of 16 in 2010.